Dhaka, Jan 17 (Just News): Finance minister Abul Maal Abdul Muhith on Thursday acknowledged that the banking sector is not free from flaws. ‘Banking system is not free from faults. Efforts are on to correct the faults. 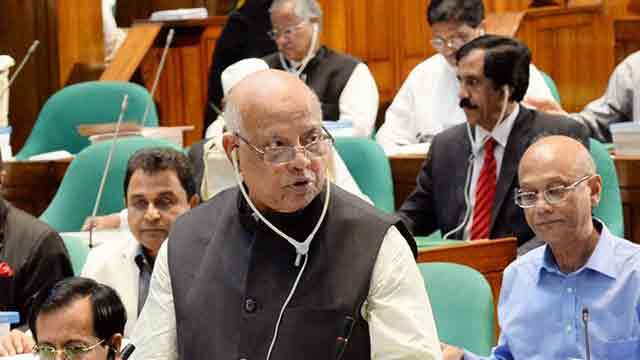 Some time is needed for the enforcement of the actions,’ Muhith told parliament while responding to a private member resolution on ensuring transparency and accountability in running banks and financial institutions without irregularities. Treasury bench MP Israfil Alam placed the private member resolution before the house with speaker Shirin Sharmin Chaudhury in the chair. Responding to the proposal, the finance minister highlighted the government’s various measures in ensuring good governance in the financial sectors. ‘Once, the default loan stood at 32 per cent. Now it has been reduced to 12 per cent. The government amended the banking law in 2013. It is a continuous process,’ he said, mentioning the government’s move of enacting another law on bank on Tuesday. The parliament passed the Bank Company Act allowing four members of a same family to sit on the board of a commercial bank, despite strong criticism from opposition lawmakers, economists and bankers. The finance minister later requested Israfil Alam to withdraw the notice and the MP withdrew it. Israfil said the government’s success has been marred due to some irregularities in the banking sector. ‘Country’s progress will be obstructed if the government fails to address the flaws in the sector. If the good governance is not ensured in the banking sector, the crisis in running the state affairs becomes visible. The banking sector was shaky in the outgoing year,’ he said. Mentioning names of some banks, including National Bank, AB Bank, NRB and Farmers Bank, the MP said that the loan default marked a sharp rise due to absence of good governance and the central bank did not take exemplary punishment. ‘Incident of taking loan with fake names took place. Directors of banks and senior officials were involved in such acts,’ he said. ‘Instead of increasing the control of Bangladesh Bank on banking sector it has been weaker. Though some measures have been taken, those are not adequate,’ he added. Alam said that the amount of default loan in government banks also rose. ‘Despite looting, the government has to provide several thousand crore of taka. It is the money of tax payers,’ he said. The MP was critical of the government for allowing new banks despite its failure to gain people’s confidence. ‘The process of allowing new banks is not stopped. Common people do not get back their money after deposition. The government’s huge success has been marred due to the failure in the banking sector,’ he said, adding that a sense of commotion had been created among the people. The MP asked the government for cancelling the license of those banks for failing to meet up the conditions. ‘Why the licenses of the banks which will fail to meet up the conditions are not cancelled? Why the licenses are being renewed?’ he posed question. Referring to the share market scam, the MP said they are yet to get the Ibrahim Khaled investigation report. ‘The names of the loan defaults should be announced. The names of officials involved with providing bad loans should be revealed. If the transparency is not ensured, this sector will not be strengthened,’ he said.